Once upon a time, when the world seemed far safer and not quite so cranky, my maternal grandmother lived next to a city dump. It wasn’t a land fill or a transfer station; it was a municipal dump site. For a curious three-year old girl with an active imagination, this was a most marvelous place! I loved wandering around its edges, finding and carrying treasures back to Grandma’s house, where I carefully placed them on the shelves of my little “store” in her back yard. I rediscovered this photograph recently and it never ceases to make me smile. 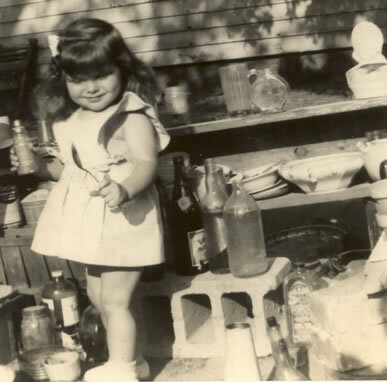 I look for myself in that little girl, and in browsing the carefully selected items organized along the shelves, I get a slight sense of how, even as a child, I possessed the same persistence and resourcefulness that has gotten me where I am today. It is my pleasure that, as I welcome you to my online store of today, I’m able to give you a sweet glimpse of my past and my very first store.